Anyone in the know about Country music will likely have heard of Thomas Rhett. The singer-songwriter is experiencing a lot of success in the US right now thanks to the huge success of his number 1 single Die a Happy Man. The song is actually his fifth number 1 but his first number 1 on the US Hot Country Songs chart. Rhett is performing at C2C: Country to Country this weekend, where he will open the main stage. To coincide with his performance, his second album Tangled Up has just been released in the UK. Tangled Up is an album that doesn’t neatly sit in the Country music genre. A definite progression from Rhett’s 2013 debut It Goes Like This, Tangled Up sees the singer-songwriter infusing his music with funk, soul and R&B sounds making for a very richly varied set of songs. Here in the UK Crash and Burn, the album’s lead single, has picked up a lot of love on BBC Radio 2 and it’s not hard to understand why. The song has an infectious uptempo beat that forces a smile on your face whether you want it or not. It’s so damn catchy that the melody lodges quickly into your brain and I can tell you now, you won’t be able to get it out. What really shines through on Tangled Up is Rhett’s passion and charisma. He has both in abundance and he conveys a lot of emotion in his vocal. Whether he’s singing a love song about his wife (Die a Happy Man) or having a bit fun (the feisty South Side), he sells every word he’s singing to you and you can’t help but join in the fun. You could almost split Tangled Up into two halves; the uptempo funky tracks and the stripped-down soulful Country numbers. Rhett convinces throughout and he possesses a cool swagger that is remarkably infectious. Highlights on the record include the dancefloor filler I Feel Good featuring Lunchmoney Lewis, the throwback soul of Tangled, and the raucous Vacation. One of the album’s most surprising moments is when Rhett teams up with former American Idol winner Jordin Sparks for the dramatic Playing With Fire. Their voices work well together and it’s an example of when an unexpected pairing delivers a fantastic collaboration. For those who prefer their Rhett a bit softer than The Day You Stop Lookin’ Back features a gorgeously simple arrangement, and of course Die a Happy Man is destined to be a wedding dance song for millions of couples across the world. 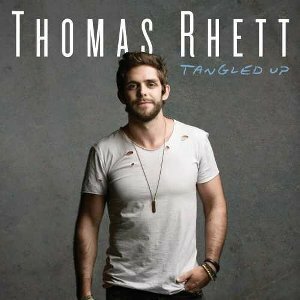 Rhett delivers over and over again on Tangled Up. This is an album with all killer and no filler, and it’s no surprise that he’s one of the fastest rising stars in Country music right now. He’s a talented vocalist and songwriter, and an incredibly charismatic performer. Anyone going to C2C this weekend is in for a real treat as Rhett will own the stage and wind up being one of the highlights of the festival.